That's right, yet another month has flown right by! Please could someone hit the pause button on this ridiculously fast carousel? If you've read my October newsletter that went out many moons ago, you know that this month, my focus was on Self Care. The very beginning of the month was, for me, incredibly anxiety inducing, and I really did need to amp up my self care to cope! If you haven't read it yet, sign up now before the October newsletter is closed! Remember, every new sign-up still gets my Essential Toolkit for Creative Bosses! Plus, all subscribers to my newsletter will have an early sneak preview of next month's set-up, FREE downloadable design elements, and a very special announcement! One final note before we get into this post, I'm now blogging twice a week! In case you didn't catch my last post, I've decided to post one extra mini-article every Wednesday! I promised you an explanation on this week's mini-post, so here's why. The last couple of weeks saw a massive growth in interest for my blog! You guys seemed to really dig all the awesome freebies, so guess what. There are loads more of those coming your way! I honestly felt so bound by the limit of just one post a week, simply because there is so much more I have to say than I could ever confine to a single post on Friday! What do you think of two blog posts per week? Alright, you've just about had enough of announcements, so let's jump right into it! 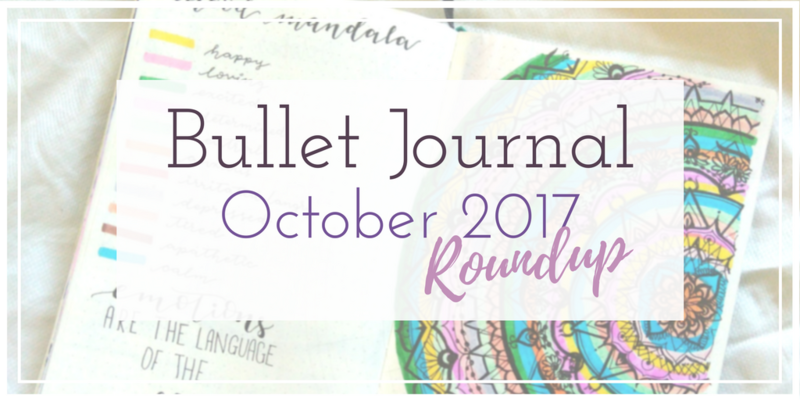 Here's a roundup of October in my Bullet Journal. This month, the visual element was pink, purple and black watercolour, with some sketchy architecture and landscape. The watercolour gradients were created with Tombow dual brush pens in 761 (pale pink), 673, 623 (purples), N60 (grey) and N15 (black). All the sketching was done using Faber Castell Pitt Artist pens in black, with sizes XS, S, F and M.
The monthly spread itself was very basic, with dates to one side, and tasks categorized into Morning and Evening columns. The categorization was actually really helpful, and is something I will be carrying into November. I also added lists of content to upload to my Instagram feed, which occupied most of the spread, making it appear a little crammed. For November, I'm contemplating creating a separate spread for my Instagram content, and restricting the design elements to smaller margins, so there is more room for actual monthly tasks! As much as I love the worn out, well-used look to this spread, it got rather difficult to refer back to what I was meant to do each day. In my September roundup post, I mentioned how my September gratitude page, while lovely to look at, was absolutely impractical. This month, I ran in the opposite direction with a table format. I split the days of the month into three simple columns of ten days each (eleven for the last one). This system worked amazingly well for me, because not only was it a step up from the usual one-line-a-day format, but it was also incredibly functional and quite frankly, a delight to fill in each day! Put in a gratitude column in your monthly tracker. That way, you'll remember to write it down as you fill up your tracker each day. This is what I do: place your gratitude page immediately after your tracker. All you have to do is flip over! Put it on your daily task reminder. 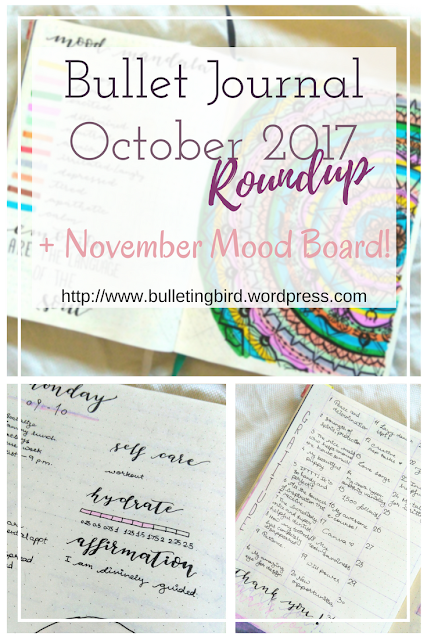 I explain the daily reminder in detail on my September roundup post, so go give that a read to learn more! In September, my tracker was far too condensed and complicated and frankly, I hated filling it up each day, just because I needed three different pens and a lot of time to draw the little zig-zags. So for this month, I went in for a simple two-page vertical tracker. 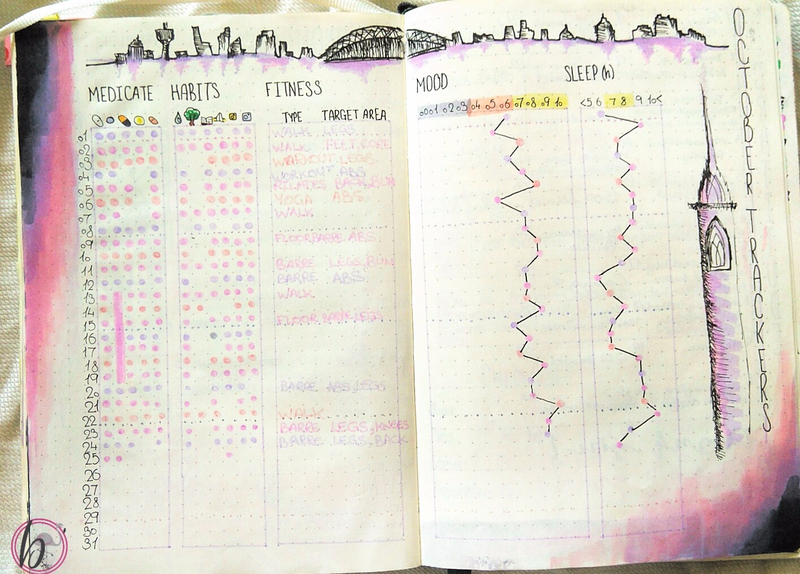 I also plugged my sleep and exercise trackers into this spread, just so everything was in one place. I've mentioned before how sleep and exercise have a massive effect on my mood, and having all three trackers in one table, right next to each other was actually a great way to analyse the state of my mental health! However, I wouldn't be me without colour (and that's funny cause I'm Indian heehee) so I did add the watercolour and architecture, with a mix of different skylines. 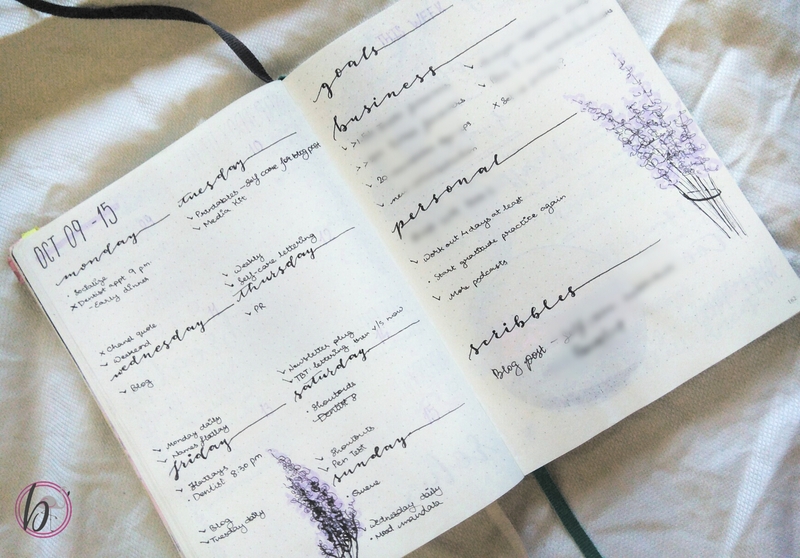 Instead of writing down what I was tracking, I decided to add tiny doodles at the top of my first two trackers - cute and space-saving! Plus, I gave each row a different colour, just to keep it a little bit interesting. All of these ideas are definitely coming into November with me! I can't believe I went seven months in my bullet journal without a mood mandala! 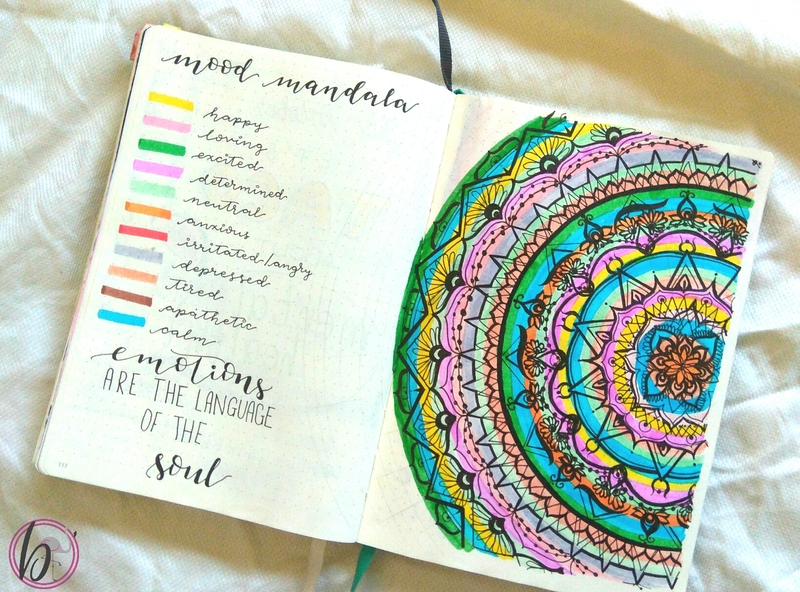 If you don't know what a mood mandala is, here's a super quick explanation. You create concentric circles across the page, one circle for each day of the month. You then create a colour chart next to it, giving each mood a different colour. You then begin colouring in one circle each day (from the inside out), and begin drawing repetitive patterns as you go! This picture was taken on the 24th of October, so there were about seven more rings for me to fill in, but look how pretty that turned out!! By the way, Kara Benz of Boho Berry is the genius behind the Mood Mandala, and she explains everything about it in this video, so go have a look at it! I'm definitely keeping the mood mandala for November (and every month after it), because it is so pleasing to look at, and very therapeutic to create! Here's my first weekly spread of the month, and I actually quite liked the whole "multiple widgets" layout of it! It was really easy to write down daily tasks in separate boxes, and having them at the top of the spread was definitely a good idea, since these boxes were easily the first thing I saw. I also added a reading list box, which I never stuck to, so that disappeared instantly. The weekly Instagram tracker, however, was very useful, and stayed through most weeks this month! I also added a mini brain-dump for my blog idea for the week (this one clearly never saw the light of day), which is also something that got carried forward every week. One thing I found rather futile is the tweet tracker. I read a post that said you should be ideally tweeting about ten times a day, and so I created a tracker with ten rows for each day. However, I then switched to automating my Twitter to share my Tumblr image feed as tweets, and that took care of the 10 tweets a day thing, so this tracker was pretty much forgotten. One weekly spread that definitely stood out for me this month was this gorgeous minimal weekly spread! 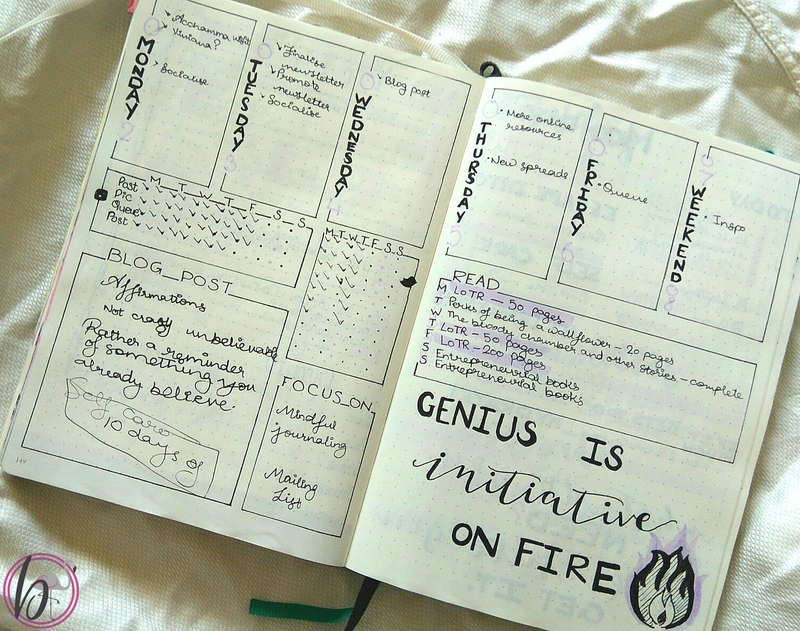 I was inspired by the tons of minimalistic bullet journal images all over Pinterest and wanted to create my own, and boy was I impressed! 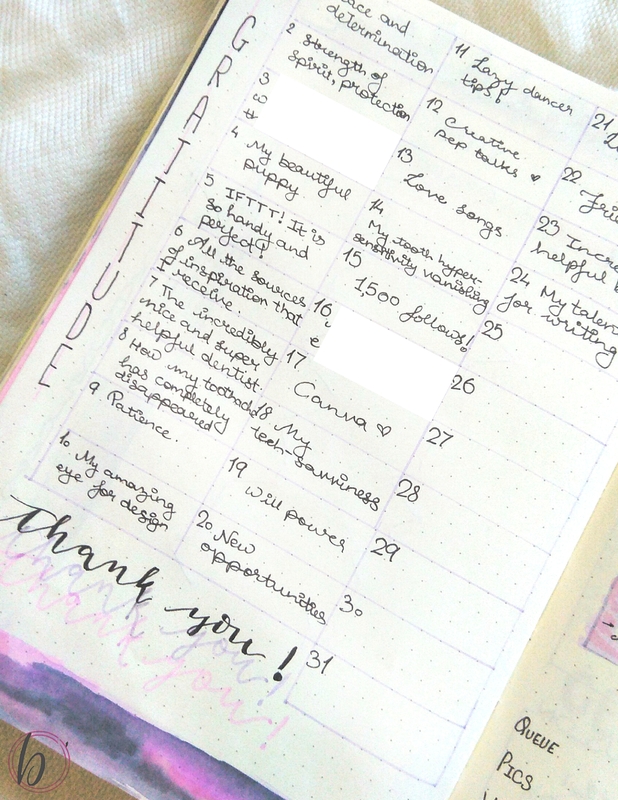 Not only was there more than enough space for my daily tasks, this week was also when I began breaking down my large monthly goals into smaller, doable weekly goals. I absolutely loved everything about this spread, and will definitely consider minimalism in my future weeklies! The one daily spread that I loved the most was this super cool, designer daily! Must admit, it was brought on by the mood mandala, which was the spread just before this one. I used the Tombow brush pens and blended them in with a waterbrush all around the titles, then went right in with Faber Castell Pitt Artist Pens in S and F to create those super pretty designs! Through this month, I stuck with the daily timeline for my task lists, simply because I find that laying my day out by the hour helps me know exactly what I should be doing at any given time, and so I end up being way more productive with a pre-planned timeline! The other common elements across all my dailies this month were self care and hydration reminders. Every day, I chose one method of self care for the day, and if things got too hectic or stressful, or if I was getting in my own way too much, I'd switch off from what I was doing and indulge a little. Now you don't need a self care reminder to do what you love, not at all! The main reason I chose to add it to my dailies is because I struggle a lot with guilt. As a high-functioning person, I tend to rely on productivity to determine my self worth - i.e. the less productive I am, the worse I feel about myself. Unfortunately, this often means that I feel incredibly guilty for indulging in self care when my brain thinks it should be working 24x7. 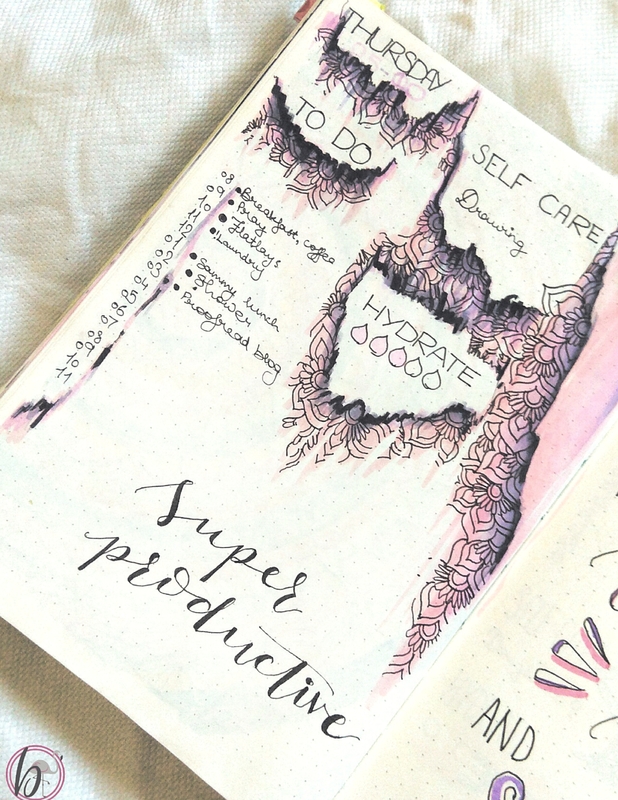 By making self care part of my daily productivity, it simultaneously eliminated my guilt and made me consciously want to get some rest and recuperation, because that was on my to-do list! That's a total win! 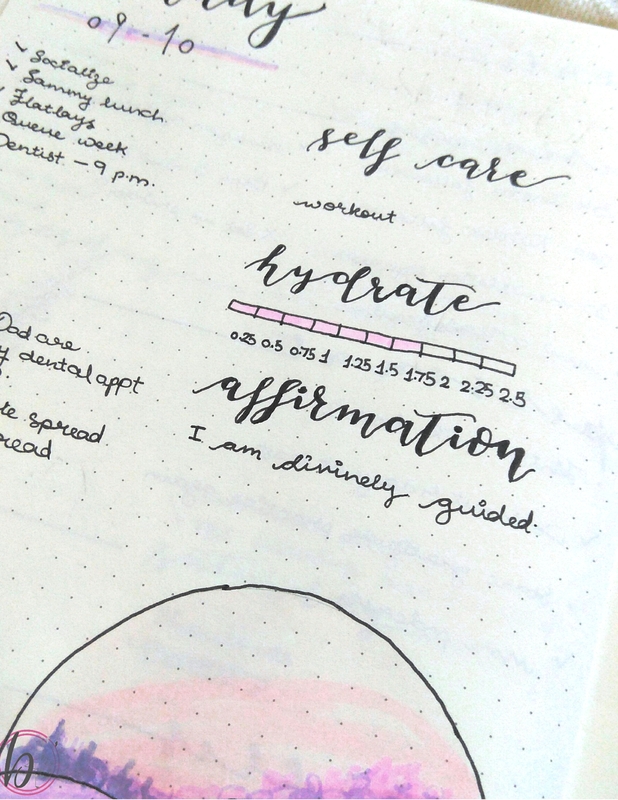 To finish up, I'll share with you one last daily layout that I've been absolutely loving, especially as I'm coming towards the end of another bullet journal. I often found that in the excitement to set up a new week, I didn't really give my weekend spreads much love. This month, I decided to put Saturdays and Sundays on the same page, but to split the page in half, so that each day had its own space. I then went on to set up timelines and add self care reminders as usual, but because everything was doubled, I had to keep the spread fairly minimal. 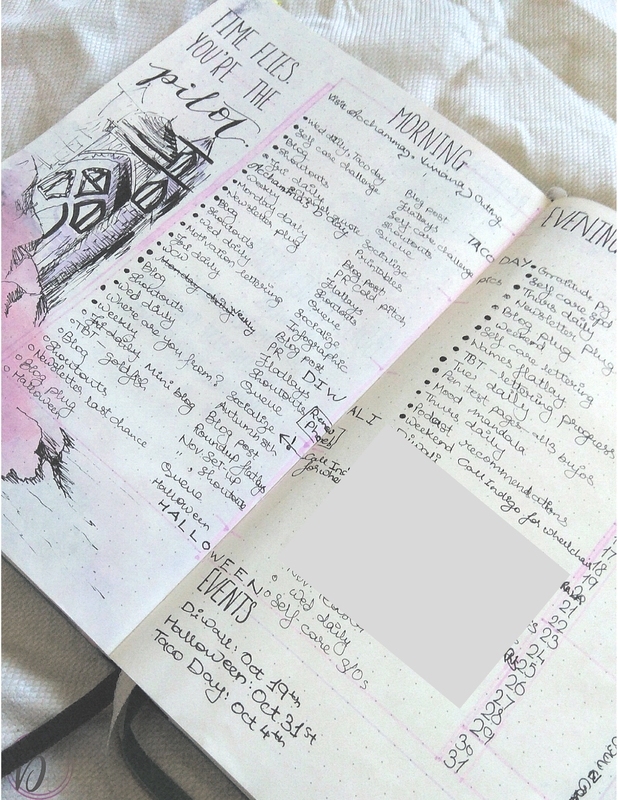 This was great, though, because my weekend spreads have never looked cleaner or better organized! This format is totally following me into November weekends! All in all, I think this month was one of the best journal months, both in terms of productivity and functionality, as well as design elements. For November, I have a few design ideas floating about, as well as a few tweaks to the month's spreads. I'm thinking of going a little bit more minimalistic, but without losing the artistic feel of my journal. Alrighty! Since you've stuck with me this far, it's time to reveal the colour scheme for November! November, to me, is the beginning of winter, when things begin to go a bit more pastel and pale, and the sunlight grows colder, and I think this colour scheme captures the essence of November beautifully! Asdjfdkjelo I'm so freaking excited about the next month, you have no idea! We're definitely ending October on a very high note, and I mostly only have you guys to thank! 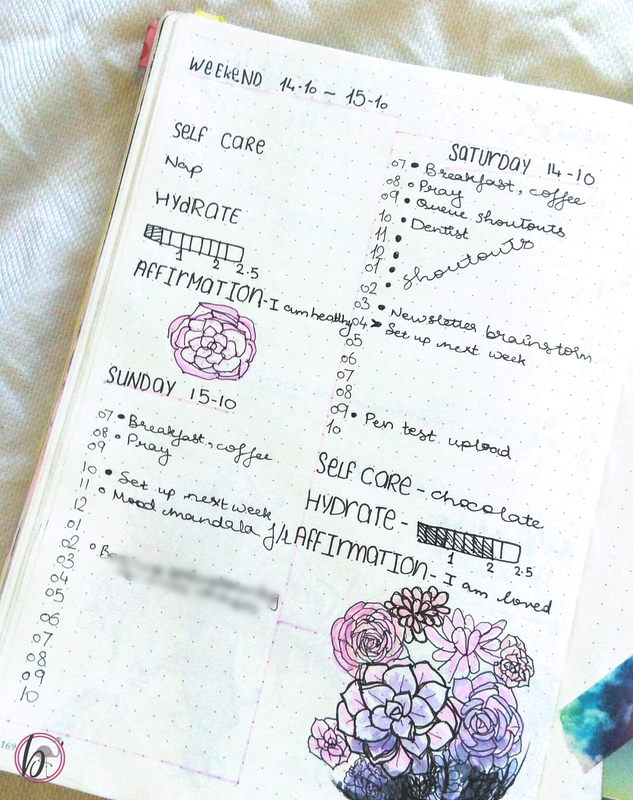 I hope this roundup has given you some ideas to add to your own bullet journal, and I'd love to see how you apply it! You can tag me on Instagram and Twitter, and I'll definitely have a look! A quick reminder that I'm still taking feedback on how you guys feel about two posts a week, so please take a second to tell me! Again, remember that my newsletter will have an early sneak preview of next month's set-up, free downloadable design elements, and a very special announcement, so if you haven't already, subscribe now so you don't miss it! And finally, please feel free to get in touch with me about collaborations, requests or feedback, or just to say hi! 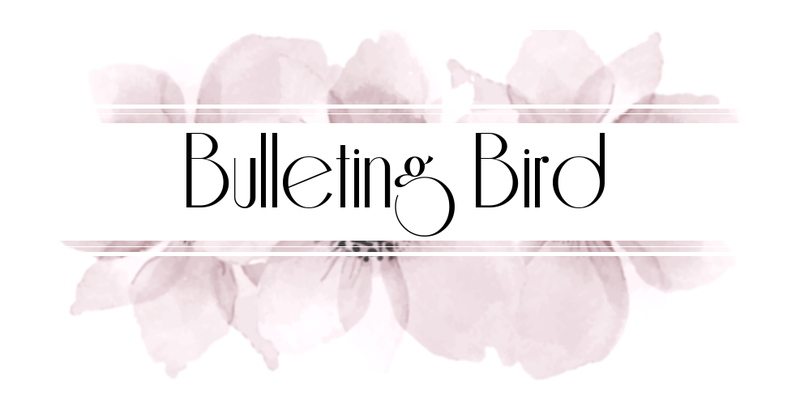 Drop me an e-mail at bulletingbird@gmail.com ! Thank you so, so much for all you kind words and encouragement through this difficult but amazing month, and I hope you've taken really good care of yourself too! I'll see you guys back here on the 1st of November! Have a happy Halloween if you celebrate it, and if you don't, have a happy Halloween anyway! That’s right, children, I am now transitioning to two blog posts a week! I found that limiting myself to one post a week was incredibly annoying, because there is just so much I need to share with you, and it is impossible to put all of it into one giant article every week. However, I didn’t want to get too ahead of myself, so here’s the plan: every Wednesday, I will upload a mini-post (pfft let’s face it, these will eventually become full-size posts because of my talent for rambling) alongwith the usual full-length blog posts every Friday! I’m still working on how to divide up all the categories and content, so please bear with me through this change! Alright because this is a short post, I’ll explain more of the ‘why’ later this week, so stay tuned for that! 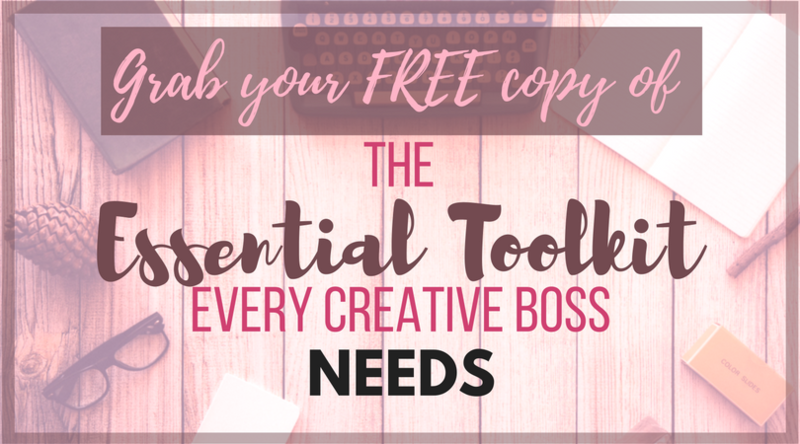 Also, if you haven’t grabbed my free essential tool kit every creative boss needs, do it now! Okay, let’s get right into it! 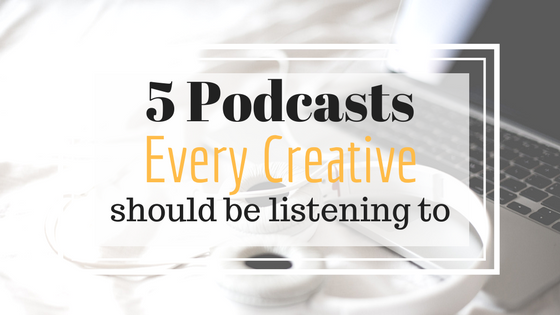 Lately, I’ve been absolutely addicted to podcasts. I find that they are a lot more engaging than reading material. I’m an auditory learner, and so hearing about concepts helps me remember them much better than reading about them. I haven’t heard of many people who prefer this learning technique, because it just doesn’t seem to be as popular as mind-mapping or flash cards….wonder why that is! Personally, I find podcasts to be a better, and much more productive alternative to music – especially if your music library hasn’t been updated since 2003. (I can’t be the only one.) 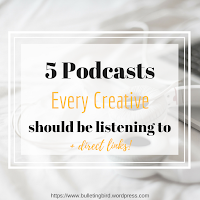 Put that together with some incredible tips and life lessons, and you have the perfect listening material for when you’re working, or creating, or even doing the chores! My favourite kind of podcasts are ones to do with creativity, self-improvement, goal-setting and entrepreneurship, and I much prefer full length solo shows over group interviews and shorter talks, but again, that’s just a personal thing. Side note: the podcatcher I use is PodcastAddict for Android, but there are loads of other softwares out there, the most popular ones being iTunes and Soundcloud! For each podcast on my list, I’ve added direct links to their audio feeds so you can find them easily. My top 5 podcast recommendations are ones I listen to every single day, especially in that golden hour between taking my sleeping medication and actually passing out. My brain is always ready to lap up new information at that time (which is weird) and I always love to feed it helpful information! Okay, I have no idea what my life was like before Andy’s insight. Creative Pep Talk is exactly what it says on the box – pep talks to boost your creativity, and how you express it. Each episode is between 30-50 minutes long, sometimes even longer (which makes me happier than it should! ), and a majority of these are solo shows (again, ticking all my boxes here, Andy!). I know I sound partial to this podcast – that’s because I am. You guys, I quite literally listen to one episode every day, and I’ve found myself coming back to replay a lot of them! Andy has brought me to so many amazing realisations, not just about my art or how I project it to the world, but also about my subconscious thoughts and beliefs, and my personality traits. Plus, every single episode (interviews included) is jam packed with so much amazing, other-wordly wisdom, put into simple, easy-to-understand words, it makes me want to cry sometimes. Yes, I’m fangirling here. Yes, it’s totally warranted. Yes, you should go listen to it right now. 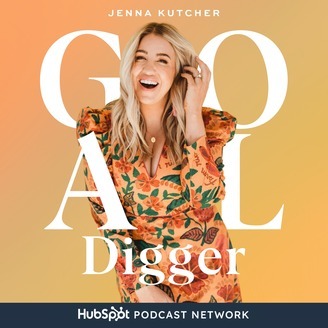 Speaking of solo shows, if you haven’t listened to Jenna’s Goal Digger Podcast, you’re seriously missing out. Her theme is a little different than Andy’s, in that this podcast is a lot more practical and grounded, with absolutely no fairytale metaphors. The Goal Digger podcast is brimming with serious, workable advice on how to set and smash goals, be more productive, network with other creatives effectively, create a thriving community…you get the idea! Plus, Jenna has loads of amazing free resources on her website. Seriously, why aren’t you listening to her yet? Okay, confession time. I’m not usually a big fan of shows with multiple hosts. I’m not going to name any podcasts, but I’ve found an irritating trend where sometimes, the hosts tend to carry each other off into irrelevant conversations and inside jokes, and as a listener, not only does it take up a lot of my time, but it also makes me feel like an outsider. Not cool. Jessica and Jaclyn have thrown this notion completely out of the water! It’s so easy to hear them talk, and while there are loads of (frankly hilarious) interjections, I find myself laughing along with them. Plus, it definitely does not take up too much air time, and their episodes are absolutely packed with more advice than I can handle in one sitting! Ranging between 25 and 50 minutes, this podcast talks about running an online business, with special focus on female entrepreneurs and troubleshooting problems specific to this niche. However, even if you don’t have a lady business, there is a ton of content in here that you can apply to your own business! Love these two, and their sometimes hilarious, noisy pets coughJessica’s laughter fitcough! 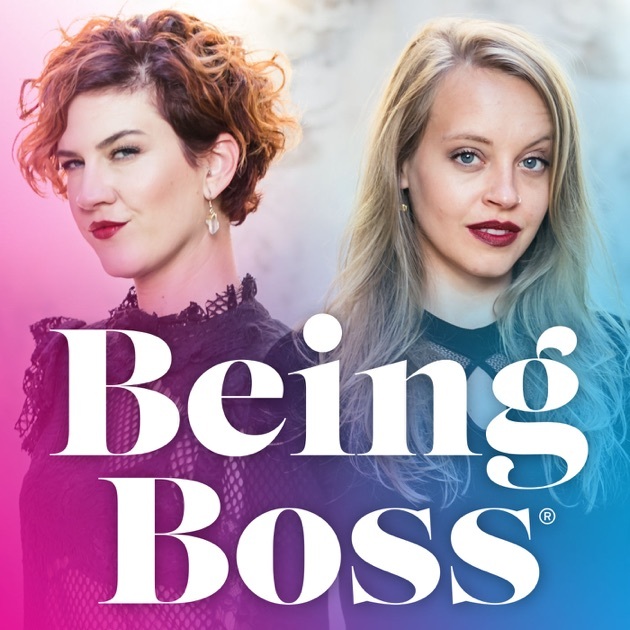 If, unlike me, you do love shows with multiple hosts and loads of amazing guest interviews, Being Boss is definitely one you should be listening to! Their main focus is on self-made, self-employed bosses, and their guests are often really talented entrepreneurs who have made it on their own terms. You can totally tell that both hosts put a lot of thought into the questions they want to ask their guests, as well as what topics their audience would want advice on, and this is a huge edge they have over other interview-led podcasts! I must admit I don’t listen to this podcast as much as I used to (or should), but I know a lot of creatives swear by Emily and Kathleen, and I definitely recommend giving it a whirl if you haven’t already! Okay, this podcast is still quite new to me, and I happened to stumble across it while looking for podcasts about running a small business. 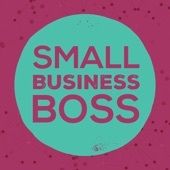 Small business boss is hosted by two amazing, genuinely helpful ladies, and like the Goal Digger podcast, has tons of really helpful, practical advice on how to take care of the nitty gritties and day to day housekeeping when it comes to your own small business. Honestly, this podcast isn’t half as popular as it should be! Hand to heart, I’ve queued up at least twenty episodes to listen to! No word of lie, Jen is probably one of my favourite podcasters in the world. Make It Happen is an amazing podcast that shows positivity-driven creatives how to stay inspired and motivated, throw competition and jealousy out the window, and stay focused on the end-game. Why is this not in the main list? Simply because there is not enough of Jen! While her full-length interviews are really well thought-out and informative, like I’ve said a thousand times already, I much prefer solo shows. The interviews tend to be about an hour long each, but her solo shows are usually less than ten minutes long! This is amazing for people with short attention spans, or very little time to dedicate to listening to podcasts, and I feel a little hypocritical calling someone (whom I love very much) out for creating bite-sized content, but I honestly crave longer episodes from Jen. That’s not to say her shorter episodes are bad, quite the opposite! They are incredibly motivating, and chocked full of seriously useful advice – to the point where I’m quite literally pleading for more! I’m hooked on self-improvement podcasts, and have absolutely no idea how to write a short blog post! Remember, I’m still giving away loads of free resources, and I’m putting some final finishing touches on that super secret project I mentioned last week, so sign up to my newsletter now to stay in the loop! Thank you so much for reading this post, I loved creating it for you! I hope you guys have an amazing week ahead, and I’ll see you again very soon! Like this post? You will love these? You guys seemed to really love last week’s post on how to grow a genuine, organic Instagram following quickly, so here’s another super helpful post to help you post amazing content for your followers! You know what a flatlay is, you’ve seen those perfectly laid out pictures on Instagram, as if a bunch of objects just “randomly” fell on to a clean background and just happened to be colour co-ordinated and neatly composed. Yeah…that’s not how it works. There is a lot of thought and planning that goes into each flatlay, and here, I’m spilling all the beans on how to achieve that gorgeous Instagram post that makes people think your life is so beautifully messy! But first, I want you to grab a copy of my free toolkit that every creative boss needs! Put your details in below, and it will be ready and waiting in your inbox! Here are 5 super-easy steps to getting the perfectInstagram flatlay, every time! No, I’m not going to tell you to go buy a fancy DSLR, I don’t even use one of those myself! A simple smart-phone camera (ideally with a resolution above 8 megapixels) works perfectly well. All you need is the ability to focus, and if you want to be in the flatlay yourself, a self-timer! For the standard flatlay, most people (myself included) prefer to hold the camera directly above the spread, most likely parallel to the floor. This gives you that amazing over-head shot which is most common across Instagram. However, if you’re feeling adventurous, it might be fun to hold your camera at a different angle, like in the image below. This adds more depth and dimension, and is a refreshing change from the standard over-head shots, and makes the spread look a lot more “real”, as if your viewers were right there in that moment with you! When it comes to the background of a flatlay, less is always better, especially if you’re new to the concept of flatlays. A simple, plain background ensures that the focus is on the actual content of your image, which is what you want to draw the eye to. Having said that, there is no reason why your background must be plain white! Loads of flatlay-pros use wooden boards, bright and colourful surfaces, and even play around with multiple textures! For instance, look at this gorgeous picture by Ami from @the_sunkissed_kitchen ! Not only is the background not white, but it is also not plain. At the same time, it is most definitely not distracting from the main content, which is that (mouth-watering) food! You get the idea, it is really not that hard to find a decent backdrop around the house! Okay, this one requires some pre-planning and effort. The lighting is a huge influencing factor to how your picture turns out. You’ve probably read loads of advice about how important it is to use natural daylight, and guess what. They’re 100% right. Truth is, we are naturally conditioned to look at everything around us in broad daylight, so of course the images that please us the most include this crucial element! Now if you’re lucky enough to live in the tropics like I am, you probably have an abundance of daylight for a large portion of the year. However, when I was at University in England, I quickly learned that sunlight is precious and very limited. Don’t worry, though, there are so many ways to work around this! Use those grey, cloudy days! When you’re having a poorly lit day, sit down and plan out your flatlays and objects you could use (see next point for more details on how to do this!). On a good day, shoot a whole bunch of pictures. Your smartphone can probably take at least 10 pictures per minute, and factoring in time for arranging your flatlays (assuming you’ve done the planning before-hand! ), you should be able to photograph about 15 completely different arrangements in an hour! Say it’s winter and you only have two to three hours of daylight, that’s an easy 45 flatlays! One other important point to remember when it comes to lighting is that direct sunlight can be just as harmful as no sunlight. Over-exposure of your objects deletes a lot of details, and may not give you the true colour composition you were hoping for. The best setting is therefore with diffused daylight, possibly filtering in through a white sheet. Alright, now that we have the basics out of the way, let’s get into the crux of the situation. Your composition is what will make or break your image. “What is this ‘composition’ you speak of, Srish?” Well, my slightly less informed friend, it is the variety of objects and elements you use in your flatlay. Simply put, it is the content of your image. A rule of thumb when coming up with your composition is to choose a ‘hero’ object – this is the element that you want to showcase most. For instance, in my flatlays, the hero is usually my bullet journal. This takes up most of the image frame, and sets the tone for all the other objects in my arrangement. Another important part of the composition is the colour scheme. In the image above, you can see that I went for a peach and grey vibe, to match the colours in my seashell. This was not a last minute decision, the colours in your composition actually go a long way to set the mood for your image! Without going into too much confusing detail, here’s a hack for super easy colour inspiration: use a mood board! A mood board is a collection of colour co-ordinated images that make you feel a certain way. Lucky for you, tens of thousands of mood boards already exist, and all you have to do is steal a colour scheme from one of those! Here’s my own mood board on Pinterest that you can follow. I use these images for colour inspiration all the time, and there are boat loads of similar images all around Pinterest that similarly give you tons of moody, themed palettes! Now you can totally have more than one hero product, but in that case, you might want to include a lot of smaller elements around them, to prevent the image from looking too ‘heavy’. For instance, in the flatlay below, I had a couple of different bigger elements (the journal, the perfume, the camera), all pulling a certain amount of weight, but I made sure to include smaller, lighter objects (for instance, the pens and the washi tape) to counterbalance them and make for a bright, airy composition! Nailing the perfect composition takes some practice, so make sure to photograph a bunch of different arrangements to find what suits your theme the best! Psst! I’ve put together a checklist for this post that will help you create the perfect flatlay, and it also contains blocks where you can plan out different composition layouts! So you’ve taken all your pictures on that one glorious day, before the perfect lighting disappeared. Now you’ve got a whole bunch of usable raw images, and you are ready to schedule them. But let me stop you right there. Do not, I repeat, DO NOT upload the raw images! Cropping: the ideal Instagram image is square, and most phones and cameras shoot in portrait or landscape. The Instagram app itself has a very difficult to use crop function, so it is probably best to crop your image beforehand. Exposure: Okay however great the light was, chances are, your image was under- or over-exposed. Again, the Instagram image editor is fairly basic, and a specialized app will adjust your exposure a lot better! Colours: Let’s face it, we all love vibrant colours, and the camera doesn’t usually capture them well enough. You don’t need to go out and buy expensive photo editing software, there are loads of amazing free options out there! For mobile, I highly recommend Autodesk’s Pixlr! The app is incredibly powerful, and has a super easy-to-use interface that makes it beginner friendly! They also have a desktop version, but personally, I much prefer Canva for advanced image editing. All the banners on this website have been created with Canva! Plus, there are loads of free stock images on there for you to create your own graphics! 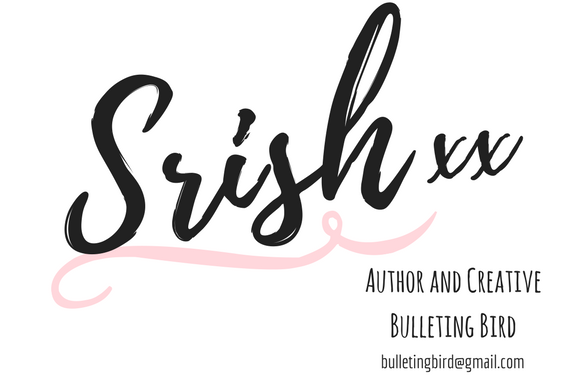 No, this post isn’t sponsored by Canva, I genuinely love the app! By post-processing, you can greatly enhance the quality of your picture, making it appear like it should. No, that is not cheating! When you set out to take the picture in the first place, you did so with a particular goal in mind. By editing your actual picture to match the goal, you are in fact sharing the most important aspect of this picture with your audience, and that is your vision. Put all these factors together, and I promise you, you’ll slay the flatlay game! 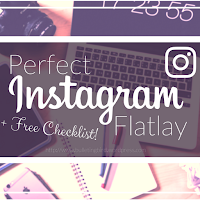 Remember, I’m giving you a free checklist to help you apply these five tips to every flatlay you make, so grab it now!!! Love this post? Remember to share it and spread the word so we can all become Instagram pros together! 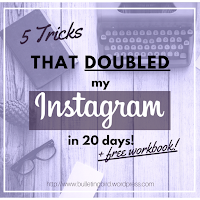 Ready to grow your Instagram? This post will honestly help! Remember, I’ve also got a collection of incredibly powerful tools that will help you be more productive and creative in your daily life, and I’m giving that away for free too! Grab it below! While you wait for it, check out my Instagram and Pinterest for more regular updates, and Tweet to me with any requests, or just to say hi! As always, thank you ever so much for reading, and remember, I love you and I’m totally cheering you on!